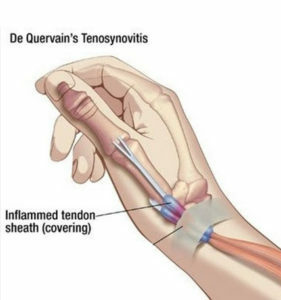 De Quervains is a painful swelling around specific tendons which move the thumb. Those who get ‘de Quervains ‘ complain of localised, thumb side, wrist pain with particular wrist and hand movement – esp pinching or grasping and twisting type movements – undoing lids, putting on a bra, using screwdrivers, knitting. The condition is named after a Swiss Surgeon Fritz de Quervain who in 1895 published the first report of the condition (a group of 5 cases) in the medical literature. No-one is sure what sets off the swelling. It is particularly common in the first few months following the birth of a baby and so many postulate a hormonal component. Certainly the tasks repeatedly done at the time – wringing out cloths, changing nappies and undoing jar and bottle tops – aggravate the problem. Often a history is noted of a rather insignificant transient pain in the wrist at the time of a direct knock to the side of the wrist, a wrench to the thumb or during some twisting movement when grasping something. This is usually ignored as minor and ‘I thought it would go away’ but instead of getting better, it gets significantly worse over the next few days. SURGERY – Persistent or recurrent cases come to surgical intervention. This involves opening the swollen tunnel through which the tendons pass.